Host Cat Deeley with the machine! 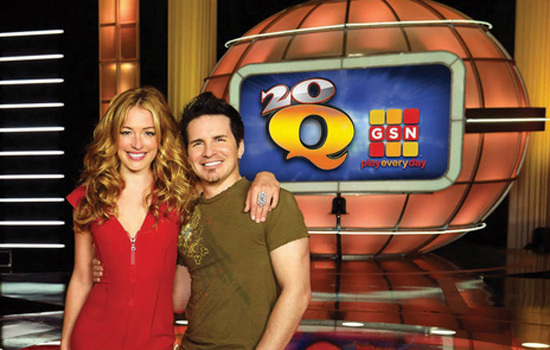 A pilot was shot for a new game show called, “20Q” nine months ago. But, on Sunday, May 17th, it returned, revived, revamped and fully computer loaded. So much so, it slowed the taping process of the show down tremendously. The show is hosted by a very charming and witty host. You’ll have to play “20 Questions” in order to guess who the host is at the end of this article.. Update: show host is Cat Deeley (“So You Think You Can Dance”). Contestants are strategically placed in the audience in rows of seven. The studio lights flicker and blink until they stop on one of these rows of contestants. At that time, a series of questions are given as clues until someone answers correctly. This process of elimination is repeated until the show has it’s first set of three players selected who go on stage for the second round of the game. The winner of this round, goes on to sit in the audience to await to play his or her competitor (the person who wins next the round) The same process of elimination is repeated to choose another three players for the second round. Winners of each round wins $5000. Whomever beats out their opponent, goes-on to battle it out with the “machine”, named “Q” to compete to win a possible $20,000. And, how could I forget, I almost got pounded in the head by a loose camera rig above me!! (NOT occurring during the earthquake). I would say “lawsuit”, but I know my chances of surviving that would have been slim-to-none. Warm-up guy, Joe called out for “Buzzerblog”. He yelled-out numerous times, “Is buzzerblog here?” He stated that he reads the blog every night, and read of an expected visit on-set that day by the game show blogger. Earlier that day, buzzerblog contacted HollywoodJunket and told us that he was being denied access from the set that day and instead was being taking out to lunch by GSN reps. Hmm…seems like it was their way of distracting him from a set report. Some viewers may or may not recognize that the set appears to be built with about two-thirds of the “Bingo America” set. I’m not positive yet, until I have a side-by-side photo of each, but I’m about 98% sure that the “Bingo America” ball is being used as the head of “Q”. Many delays, mishaps, and man-handling of the host by the stage manager – he physically placed this host with his hands as if the host were a prop– I’m sure called for an out-and-out back-stage verbal “beat-down” by this host. I could see the frustration and temper building-up between abundant breaks. With this much stopping-and-starting between filming, it was hard to follow the show. So, I cannot determine how well the show will do on TV. But, I’m sure later tapings will be go much more smoother now after they’ve gotten their first rehearsal out of the way. The show starts airing sometime next month. No official date has been released yet. Now, it’s time to play “20Q”. Here’s your FIRST 10 questions to guess the show’s host’s identity. Playing in the category of, “Celebrity”. Is this person: 1) film star 2) TV star 3) married 4) single 5) Canadian 6) male 7) female 8) over 50 yrs 9) singer 10) has Vegas show … last 10 questions later. 20Q Game Show is the worst and idiotic Show on GSN, my family and also everyone of my friends turn GSN off as soon as it comes on.